Arabs break into archaeological garden at Samuel's tomb and pave plot, as first stage in creating parking lot to collect fees from visitors. 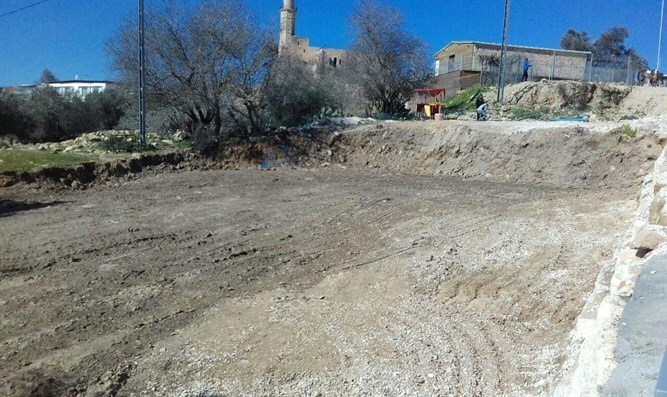 Arab residents of the village Nabi Samuel have seized control of a nearby archaeological site and have begun to pave a new, illegal parking lot. "This is a National Park that was created for the protection of this sacred area. The work must be halted immediately," said a spokesman for the Regavim movement for protecting Israel's sovereignty and resources. The Tomb of the Prophet Samuel, adjacent to Givat Zeev and the northern Jerusalem neighborhood of Ramot, is considered a holy site by all three major faiths. Hundreds of thousands of pilgrims, archaeologists, historians, and tourists visit the site each year to pray, learn, and enjoy the panoramic view of Jerusalem. The area was declared a national heritage site and the rich archaeological remains, dating back to the Second Temple era, as well as the ancient oak trees covering the hilltop are all protected by National Park status. 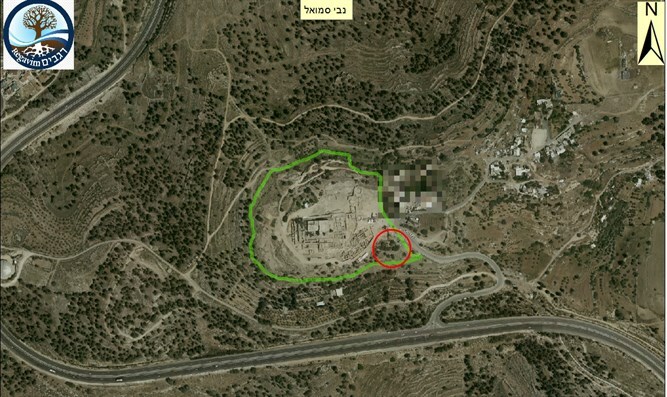 Recently, Arab residents of nearby Nabi Samuel broke into the archaeological garden and used heavy machinery to pave a large plot, apparently as the first stage in creating a parking lot as a means of collecting fees from visitors to the site. The area is under full Israeli jurisdiction (Area C), only a short walk from Ramot, a northern Jerusalem neighborhood, and the Har Shmuel and Givat Zeev communities. The site offers a commanding panoramic view of Jerusalem, and served as a major artillery base for the Jordanian bombardment of Jerusalem. The archaeological finds at the site bear witness to Jewish settlement from the First Temple period through the Hasmonean Era, up to modern times. 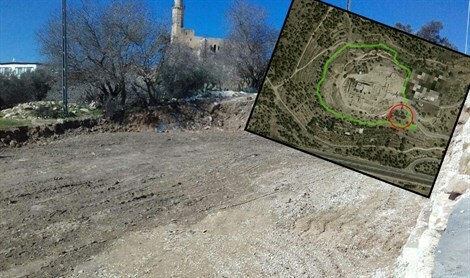 Regavim, a non-profit organization that acts to protect Israel's land resources against illegal seizure and construction, documented the work being carried out at the site without permits and in violation of the law – and issued an urgent request to the Civil Administration, the body responsible for law enforcement in Area C, demanding that the work be halted immediately. "The Civil Administration and the Israeli government must do everything in their power to block construction of the parking lot," wrote Attorney Avi Segal in his letter to the Civil Administration. "The authorities' negligence has caused a major blow to the archaeological finds as well as to the rule of law." "It is difficult to assess the extent of the damage to the archaeological site, or the potential damage to the still-unexplored, ancient sub-strata," adds Regavim Judea and Samaria Field Director Yishai Hemo. "We've seen damage to important sites throughout Judea and Samaria, caused by construction in areas of tremendous historic significance and destruction of antiquities, in complete disregard of the law. We've said it before: People who care about the Land of Israel don't cause it harm. The government must stop the destruction."